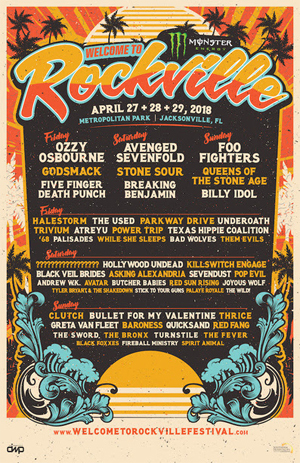 FOO FIGHTERS, OZZY OSBOURNE, AVENGED SEVENFOLD, QUEENS OF THE STONE AGE, BILLY IDOL, GODSMACK, STONE SOUR, and FIVE FINGER DEATH PUNCH lead the bill for the eighth annual Monster Energy Welcome To Rockville, as Florida’s Biggest Rock Experience grows to three days – Friday, April 27, Saturday, April 28 & Sunday, April 29 – at Metropolitan Park in Jacksonville, FL. Saturday, April 28: Avenged Sevenfold, Stone Sour, Breaking Benjamin, ??? (to be announced), Hollywood Undead, Killswitch Engage, Black Veil Brides, Asking Alexandria, Sevendust, Pop Evil, Andrew W.K., Avatar, Butcher Babies, Red Sun Rising, Joyous Wolf, Tyler Bryant & The Shakedown, Stick To Your Guns, Palaye Royale, The Wild! Monster Energy Welcome To Rockville “Grub” will include local favorites: Indochine (voted Jacksonville’s “Best Thai”), Mojo's BBQ (unique barbeque experience), and TacoLu (the Bangin’ Bus serving Bangin’ Shrimp tacos, and other TacoLu classics). Additional food vendors include: Angry Bird Grill, Ben’s Burrito Bowl, Brucci’s, Catullo Brothers, Cely’s Filipino Food, Classic Home Cookin’, Funnel Cake Fantasy, Girls Gone Green Nacho Bar, Grumpy’s Homemade Ice Cream, GuanaBana Ice Pops, Hebros Bacon Restaurant, Island Noodles, Knuckle Sandwiches, Mac Attack, Mount Olympus Greek, Nomi's Island Girl Foods, Ollie’s Tots, Pele's Wood Fired Pizza, Pie Baby, Rock N’ Roll Arepas, and What’s The Catch Fish Tacos.